Sam Snead has a chain of restaurants named in his honor – Sam Snead’s Tavern – now the legendary golfer has a beer named after him. The Slammin’ Sam Beer Company is introducing “Slammin’ Sam,” a craft-brewed premium American lager. The brewskie is debuting this week at The Greenbrier Resort in conjunction with the centennial of Snead’s birth (and the PGA Tour’s Greenbrier Classic). 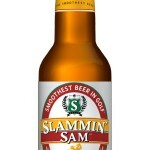 The company says Slammin’ Sam features a “refreshing taste with an exceptionally balanced finish” that makes it the “Smoothest Beer in Golf.” It showcases a proprietary recipe developed by Ray Klimovitz, recipient of the 2011 Distinguished Life Service Award from the Master Brewers Association of the Americas. Made in Wisconsin by Stevens Point Brewery – a World Beer Cup multiple Gold Medal award winner – Slammin’ Sam is available in cans, bottles and kegs. Slammin’ Sam will launch soon at other resorts throughout North America, as well as golf courses, restaurants and bars. The line’s packaging and marketing depict famous images of Snead from the 1950’s and ‘60’s. Steve Pike has been covering the golf equipment industry for more than 25 years. “Spike” is a 12-handicap who as played golf around the world, from Scotland to China.